Tesla is a trendsetter. Consequently, it’s involved in more than just electric vehicles. However, this ambition has begun to invite fierce competition. The Tesla solar roof project’s monopoly is now in doubt. What’s more, the threat is from a surprising source. 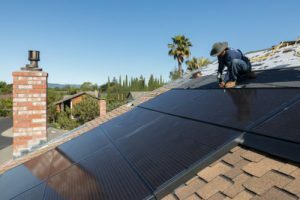 Embedded with solar cells, the company’s rooftop tiles are popular among clean energy advocates. Granted, they’re not cheap. Recent estimates value one square foot at $21.85. Moreover, just 35% of the roof is made of solar tiles. Nevertheless, the technology is still relatively new. As a result, Tesla’s success (or lack thereof) has been heeded by some outside of the clean energy space. That’s right, roofers are now involved. What’s more, they’re a direct threat to Tesla. GAF Materials has already received 200 orders for its own patented version of a solar roof. Furthermore, they plan to ship 2,000 more in 2019. However, Tesla’s product differs in a couple of ways. Firstly, Mr. Musk & Co. offers a customizable product. Secondly, the Tesla solar roof operation is built on a made-to-order model. Meanwhile, GAF’s model is ready to install out of the box. It’s a one-size-fits-all option. Additionally, other roofing competitors now affix panels to rooftops. Nevertheless, Tesla is still the biggest player. However, their lack of success alarms market watchers. Granted, as always, increased competition boosts innovation. This is evident in the electric vehicle space. Currently, Tesla still enjoys market dominance, especially in the west. However, nearly every major automaker has entered the game. GM has virtually abandoned combustible-engines. Harley-Davidson plans to introduce its own line of electric bikes. Furthermore, Porsche offers 2 years of charging station access to Taycan owners. Like EVs, solar roof technology heavily relies on lithium-ion batteries. As a result, lithium is a highly sought-after commodity among both corporations and governments. After all, solar panels store and distribute their energy through Li-Ion batteries. This threat to Tesla is sure to boost the performance of these eco-friendly tools.